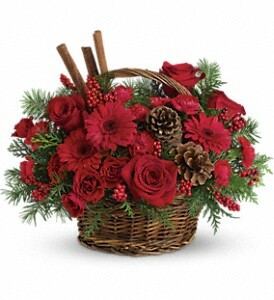 A magnificent arrangement for any holiday event. 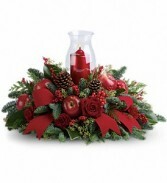 As a beautiful Christmas centerpiece or mantle decoration, this unique arrangement mixes shiny red apples with festive greens around the base of a glowing pillar candle. The clear hurricane adds a traditional touch. 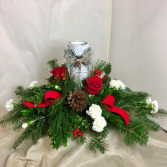 Shiny red apples, red berries and pinecones are combined with Christmas greens including noble fir, flat cedar, magnolia leaves and seeded eucalyptus below a red pillar candle with glass hurricane. Decorated with velvet ribbon. 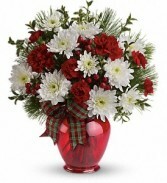 Frangrant fresh variety of pines, long-lasting bright carnations, berries and pinecones. Price shown includes 2 gorgeous red roses! If ordered at $64.95, the candle is taller, arrangement has more flowers. If ordered at $44.95, candle shorter and arrangement size a bit smaller, No roses. OUR DELIVERY AREA ONLY - SEE ZIP CODES on bottom of home page.